What people need for 2017 isn’t the latest computer line from Apple but a solid plan for their healthcare needs. The free Health Insurance Plans for South Carolina through Utah templates are here to help you do just that. 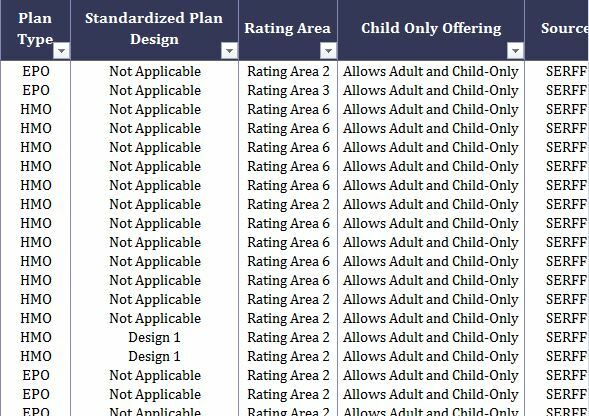 Put simply, this list of templates has all the information about each plan offered and covered for each state. You can use the tools that come with these documents to filter through that data until you find a plan that matches your needs. It’s really that simple. We’ve taken a process that takes hours and condensed it to a few short minutes. You can get started today by downloading and following along with the free guide below. These templates cover plans for South Carolina, South Dakota, Tennessee, Texas, and Utah. To start, go to the bottom of this page and follow the link next to your state to begin the downloading process. Once you have the template click the file to open it and get started. Now, take a look at the cool features this template has to offer. Now, let’s run you through an example to get you started. You will need to select your state, county, and provider to populate the items that will remain in the system. Next, scroll over to the categories in the other columns and take a look at the items mentioned. You want to use the filters to choose what parts of your new healthcare plan that you want to keep and those which you need to ditch. By the time you’ve gone through all the items in the Health Insurance Plans for South Carolina through Utah, you should be left with the plan tailor made for you.